The combination of Ontario garlic & organic apple cider is a medicinal, fat-bursting duo that tastes fresh, light and suitable for any kind of salad. 1) Place spinach into a large bowl. 2) Cook bacon in a large skillet over medium heat for about 10 minutes, or until it is just crispy. Remove bacon from pan and place on a plate lined with paper towels. Drain any remaining fat from skillet. 3) Add olive oil and onions to the skillet and cook for about 2 minutes, or until onions soften slightly. Add mushrooms tot he pan and cook, stirring frequently, for 2 more minutes. 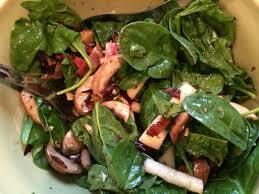 Put onions and mushrooms on top of the spinach. 4) Add Apple Cider & Garlic Vinaigrette tot he skillet and turn heat up to medium-high. Stir to scrape up any that are stuck to the bottom of the pan, just enough to heat through dressing. Whisk in mustard, salt and pepper, to taste. Pour warm Apple Cider & Garlic Vinaigrette dressing over the mushrooms and spinach and toss until the vegetables are well coated. Sprinkle the bacon on top and serve.